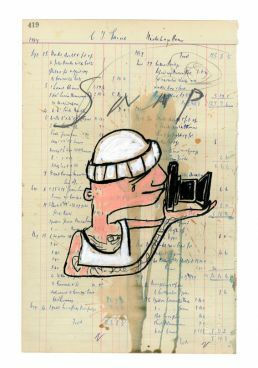 From a series of 300 original drawings on antique ledger paper, from a collection of sourced ledgers dating from 1860 – 1960’s. Drawings are various sizes but primarily the ledger paper is A4 – A3.The drawings are a continued study of my observations of the everyday. Embossed and stamped. This drawing is available as a limited edition print. Prints are limited and are posted in a tube wrapped in conservation tissue. A certificate of authenticity accompanies each print.